Teach your rat to fetch a ball from a tunnel! Get a plastic ball, poke several holes around it, and push a treat into the ball. Get a tall glass that your rat can fit into, lay the glass on its side, show the ball to your rat so they can smell the treat, then toss the ball into the glass. When they pull the ball out of the glass, give them a treat and take the ball away. Repeat the process until your rat is used to fetching the ball from the glass. Get a slightly longer tunnel, such as a a large cardboard tube or a piece of PVC pipe. Put one side of the tunnel against a wall to seal that side, then prop the other side of the tunnel up onto a paper towel roll or a small pillow to create a slight slant in the tube. 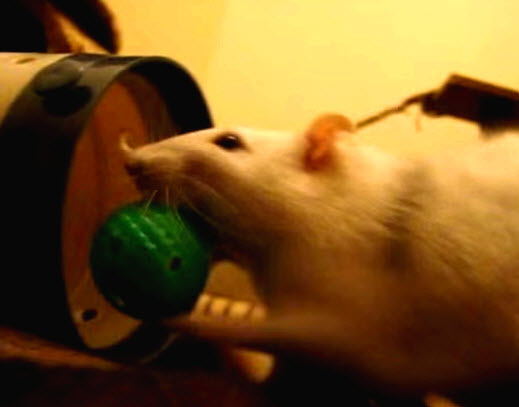 Toss the ball into the tunnel and reward your rat with a treat when they remove the ball from the tunnel. Repeat the training, using a longer tunnel each time.